Ahead of the UK release of I Kill Giants, we look back at some previous movies in which children face off against monsters. As children, we were all afraid of monsters. We’re sure you’ll all remember asking to keep the lights on when you went to sleep, or have someone check the dark corners of your bedroom to make sure no creatures were lurking behind the curtains, in the cupboard or under the bed. But as we grew a little older, our childish fears came to be replaced with real-world struggles as we dealt with pressures from home and school and our own rapidly developing minds and bodies. 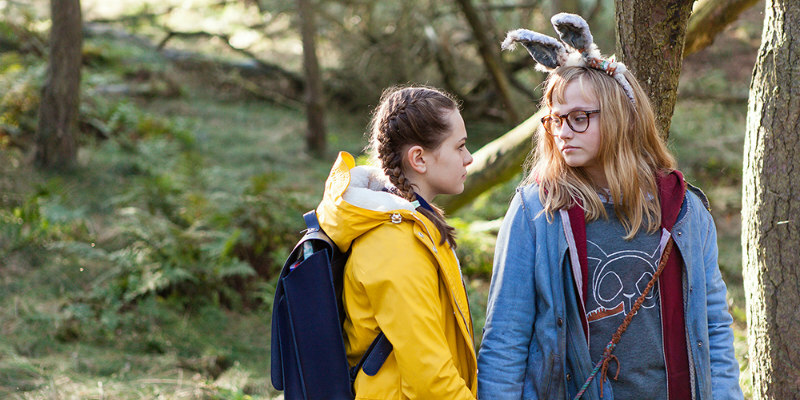 The intersection between childish imaginings and harsh reality has created some of cinema’s most enthralling images, and the most recent film to explore this is I Kill Giants, a fantasy drama adapted from the famous graphic novel of the same name and helmed by Danish director Anders Walter. The film is also produced by Chris Columbus, the man who directed the first two Harry Potter films and someone who certainly knows a thing or two about capturing the exciting, imaginary world of children. I Kill Giants tells the story of Barbara Thorson (Madison Wolfe), a teenage girl who escapes the realities of a troubled school and family life by retreating into a magical world fighting evil ‘giants’ – colossal monsters who attack her quiet coastal town. With the help of her new friend Sophia (Sydney Wade) and her school counsellor (Zoe Saldana), Barbara must learn to face her fears – tackling the bullies at school, coming to terms with her difficult home life and battling the mythic giants that threaten her world. To celebrate the UK cinema release of I Kill Giants on April 6th, we’re looking back at five of the best coming-of-age films where children have to face off against some of the scariest monsters imaginable in order to conquer their fears. Twelve years before Guillermo del Toro won a Best Picture Academy Award for The Shape of Water, the director was nominated for Best Foreign Language Film with his fantasy masterpiece Pan’s Labyrinth. Taking place during the bitter domestic conflict between General Franco’s forces and the Marquis rebels in 1944, the story centres on Ofelia (Ivana Baquero), a young girl who escapes the terror of her surroundings by entering a fairy tale world of myth and monsters. Del Toro has always been an expert at creating magical and nightmarish worlds, and most fans of the film will admit to being just a little bit terrified of the Pale Man, a horrifying pallid creature with eyes in its hands played by the great creature actor Doug Jones (who also plays the amphibian man in Del Toro’s latest Oscar winner). Anyone who has seen Pan’s Labyrinth will know…the Pale Man is one monster you do not want to find under your bed! Arguably the greatest animated film of all time, Hayao Miyazaki's Oscar winning Spirited Away tells the story of a young girl called Chihiro who is upset at being dragged away from her old home and friends to live somewhere new. When her parents take a detour on the way to their new home the trio unknowingly enter a magical world after visiting a mysterious abandoned amusement park. Chihiro then watches as her pig-headed parents are transformed into literal hogs! During the adventures that follow, Chihiro encounters a dragon, a wicked witch and a glutinous ghost called No-Face as she battles to save her parents from their porcine fate. The film remains the highest grossing Japanese release of all time and is a mainstay on critics’ ‘best film’ lists for its visionary imagination and beautifully detailed animation. David Bowie sadly passed away in January 2016, but we can fondly look back on his iconic film performance as Jareth the Goblin King in Labyrinth. The film follows the adventures of Sarah (Jennifer Connelly), whose selfish attitude and resentment towards her baby brother led to his being stolen away by the devious Goblin King. Now Sarah must enter into the magical upside-down world of the labyrinth and ultimately outwit her foe to save her helpless sibling. The film is directed by Jim Henson, who brings his trademark host of weird and wonderful puppets to the film, including deceptive dwarf Hoggle, gentle-giant Ludo. and the chivalrous Sir Didymus atop his trusty steed Ambrosius the sheepdog. Plus there’s the mesmerising scene of Bowie doing contact juggling with some crystal balls…what’s not to like?